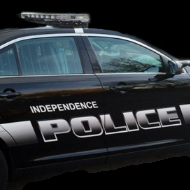 An Independence Police officers vehicle was struck by a man in a stolen Ford F-350 around 2:00 p.m. today. Officers involved in the pursuit lost sight of it near 40 Highway and Blue Ridge Cutoff. At one point the vehicle reached speeds of nearly 100 mph. The Kansas City Missouri Police helicopter assisted in the search for the suspect and spotted the stolen truck in Raytown. The man was taken into custody.